This is a truly electrifying story that begins a week before the dawn of the year 2000, when almost everyone on this planet was biting their nails, just waiting for Y2K to destroy us all. To really offer the viewer a background, the author begins with an exciting Prologue. The date is February 16, 1991. The tale begins in Saudi Arabia during Operation Desert Storm, when a young soldier is horribly wounded and waiting for an evac helicopter to take him to a nice clean hospital. Sadly, he is too far gone, and a Dr. Bishop comes to comfort him and stay with him until the end. The soldier tries to tell Dr. Bishop something as he slowly succumbs to the morphine that was given to him for his pain. "Many children. Dead. Innocents. Stop the Resonator; stop the murder." These are the soldier's last words, and Dr. Bishop can't forget them. On to December 23, 1999. Sammy Greene was a former radio personality in the East and is now on a late night talk show in Los Angeles. It is mere days before the turn of the century. Y2K is right around the corner when the Santa Ana winds (the Devil Winds) start blowing. Fires commence and half of the city is smouldering. On Sammy's talk show all the 'loons' are coming out of the woodwork and telling anyone who will listen about the hideous things that are about to happen to the world. A listener calls in to inform Sammy and her audience that a dead body was found in the hills, and Sammy finds out that the deceased girl is the daughter of an old family friend from her home town. As she delves into the tragedy, Sammy tries to find out what actually happened. With the help of the dead girl's father and an old boyfriend who is now a doctor, Sammy uncovers the fact that the death is not an accident, but a murder that was covered up by the wildfires taking out the city. She enlists the help of her friends at the radio station and her boyfriend whose boss just happens to be Dr. Bishop, the man first introduced in Saudi Arabia. The Resonator warning from the dying soldier is about to come into play as Sammy and friends discover a wicked plan that could kill many, many people. Time is running out in the big city and Sammy is most definitely playing with fire as she tries to stop the danger that definitely outweighs the Y2K controversy. There are so many great characters in this story including: Sammy's estranged father Jeffrey Greene, a real estate magnate; Neil Prescott, a crooked congressman; Albert Miller, a CIA operative; and, Madam Kaye, who is a real MADAM. Readers will never guess the plot lines - especially the Madam's 'link' in the story. Just wait until you find out who she is! And, literally everyone has a part in this deliciously Mickey Spillane-'like' story. Quill Says: Loaded with suspense and mystery. 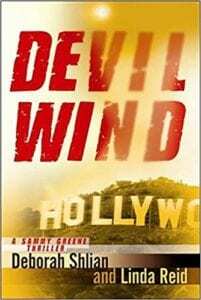 This story has corruption at the highest level of government and police departments, murder, and fear all encompassed by those hot devil winds. What more could a suspense reader want?